The March program page gets you through tomorrow (I've highlighted some events below) and the April page is ready to go. Please note that Trails of History sites will be closed on Sunday, April 1, for Easter (with the possible exception of Washington Crossing Historic Park - please check their website before heading there). So, we're at the end of March. I thought I'd share a few items that have come across the radar here at Trailheads HQ but haven't made it into previous posts. I really love this photo. 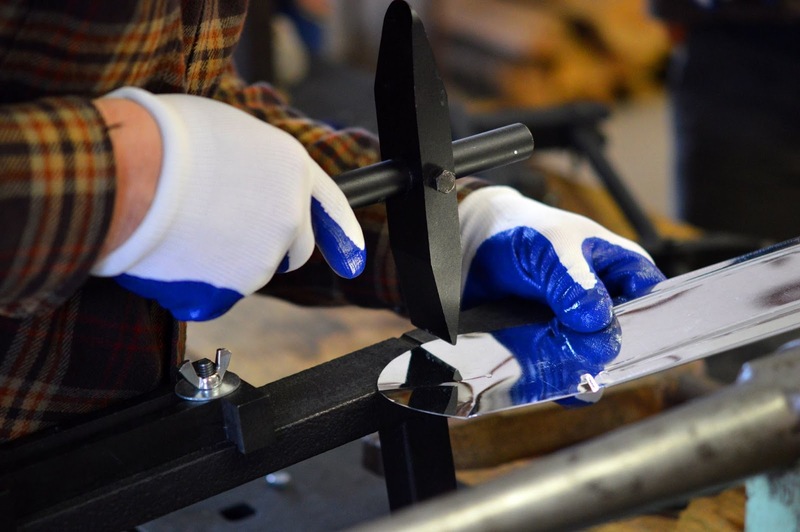 It was posted along with several others from Somerset Historical Center's recent tinsmithing workshop. Roy and Sharon Phillips helped workshop participants learn how to make a variety of tinware forms, including a candle sconce, a drinking mug, and a 3-sided lantern. They used tools from several different eras of tinsmithing, so participants learned skills as well as the history of the craft. Check out Somerset Historical Center's calendar of events for more hands-on classes coming up this spring and summer. Leadership Lackawanna Core Program participants learn leadership, interpersonal, and managerial skills, as well an understanding of community issues and topics. Jim Lockwood, of the Times-Tribune, recently reported that the Class of 2018 is working with the Anthracite Heritage Museum to mark 250 years of anthracite mining in the U.S. The class members will be procuring a commemorative plaque to be placed at the museum, which documents and interprets Northeast Pennsylvania's history of hard-coal mining, as well as its related industries, businesses, and immigrant culture. The plaque will be dedicated at a cocktail reception on May 10. As we lurch fitfully into spring (surely, we're just about there), many thoughts turn to gardens and gardening. Chef Walter Staib posted earlier this week that he is preparing an episode of his award-winning Taste of History program featuring the gardens at Pennsbury Manor. Staib's show focuses on 18th-century cuisine and cooking throughout the world, and he filmed scenes for two episodes at Pennsbury back in November (see photos from the shoot). I'm not sure when either will air, but we'll be sure to let you know. The PHMC has approved 16 new historical markers, commemorating a wide range of people and topics from Pennsylvania's history (full list in press release). To learn more about the Historical Marker Program, including how to submit a person, place, or event for consideration, visit the State Historic Preservation Office marker page. And since we're saying goodbye for now to Women's History Month, check out this list of current markers related to women's history.